You can’t swing like a boss if you miss the sweet spot. That we all know. There are many ways to determine the impact point on a club like impact tape, putting baby powder on the clubface, and all sorts of others. Swing Boss takes the impact zone to a whole new visual level. 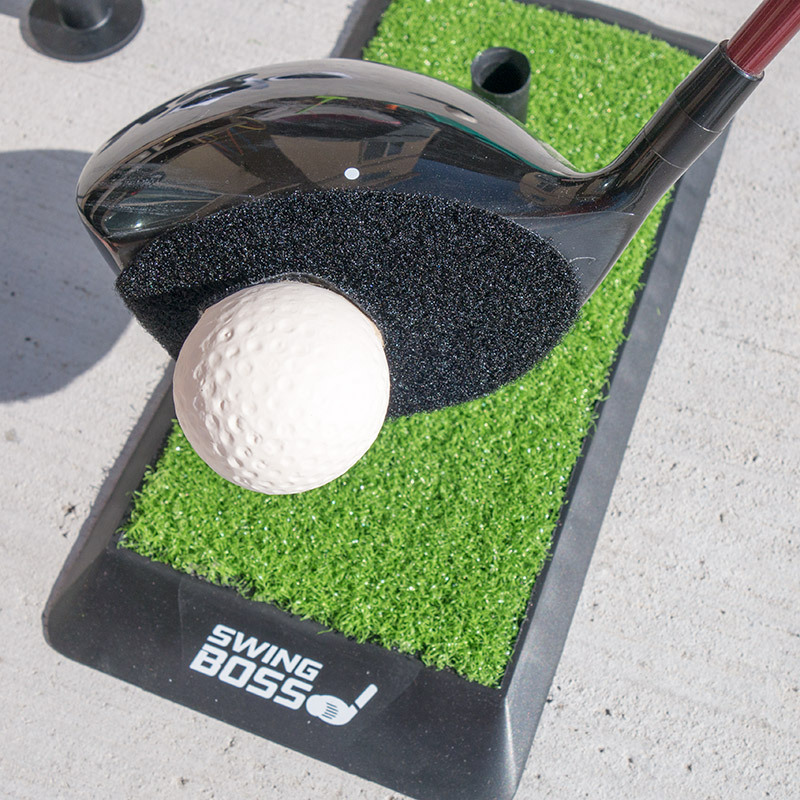 The Swing Boss golf accessory/golf training aid shows you exactly where the ball hits the clubface because the ball stays on the clubface! 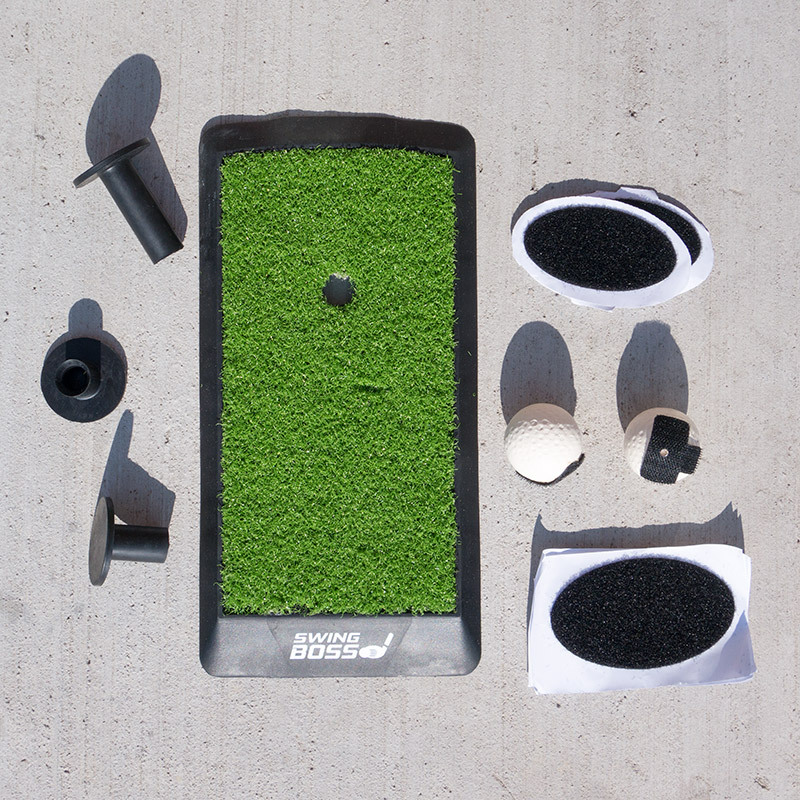 The system utilizes mushy golf balls with velcro on them, velcro club-face tape, and a small practice mat with rubber tee. There are varying sizes in the club face velcro and varying tee sizes so the golfer can use multiple club types. Off-center shots are unpredictable in distance and accuracy. Hitting the center of the club-face is huge. The player’s distance will be maximized and consistent. The control the golfer has will be optimized. For $36 a golfer will get very important feedback. Before last season I complained to my regular golf buddy who I’d played thousands of rounds with. “I keep hitting it on the toe.” I could see the marks on the clubface. He said, “Duh! Move closer to the ball.” So I setup with the ball the same amount closer to me that the off-center hit was toward the toe. BINGO. Huge improvement. I started hitting some of the longest drives EVER. Knowing how to adjust one’s swing to get the impact on the swing spot is extremely important. Once you start hitting the sweet spot you are the boss, the Swing Boss. Hmmmmm, different way to show impact, yes. I am thinking though, that the tiny mat will move if the club brushes the “grass” prior to the upswing, therefore throwing off any measurement. 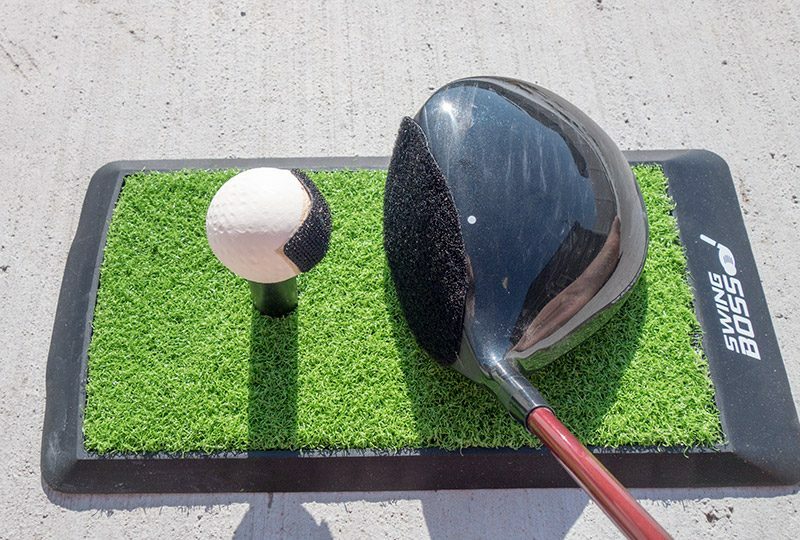 One could also just use the rubber tees at a standard range with mats, or just use the ball without the mat as well. 2016 Golf Season Looms: Can I Rediscover and Fall in Love With the Game Again?